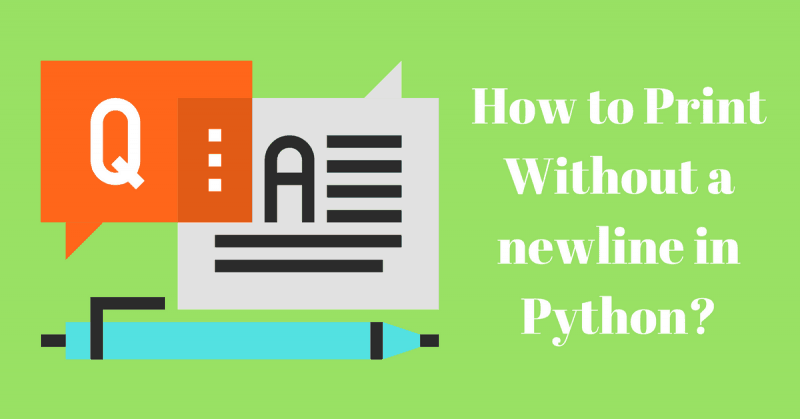 Python is one of the easiest programming languages to learn. One of the first programs that you write when you start learning any new programming language is a hello world program. Just one line and boom you have your hello world program. In Python 3, print() is a function that prints out things onto the screen (print was a statement in Python 2). As you can see, it is a very simple function. Yet there is one thing that is really annoying about this function. It automatically prints a newline ‘\n’ at the end of the line! As you can notice, the two strings are not printed one after the other on the same line but on separate lines instead. Even though this might be what you actually want, but that’s not always the case. if you’re coming from another language, you might be more comfortable with explicitly mentioning whether a newline should be printed out or not. So what should we do if we want no newline characters in python? Let’s jump right into the solution! Python 3 provides the simplest solution, all you have to do is to provide one extra argument to the print function. You can use the optional named argument end to explicitly mention the string that should be appended at the end of the line. Whatever you provide as the end argument is going to be the terminating string. So if you provide an empty string, then no newline characters, and no spaces will be appended to your input. print "My name is Karim"
As you can see, even though there was no newlines, we still got a space character between the two print statements. If you actually needed a space, then this is the simplest and most straightforward way to go. But what if you want to print without a space or newline? In this you can, you should use the all-powerful sys.stdout.write function from the sys module. This function will only print whatever you explicitly tell it to print. There are no terminating strings. In Python 3, you can use the named end argument in the print function and assign an empty string to this argument to prevent the terminating newline. Thank you, Karim. This feature of Python really irritated me… At a restaurant, perhaps I like getting more (good things) than I had asked for, but in programming, I want exactly and only what I asked for. With your help, that’s what Python is now giving me!